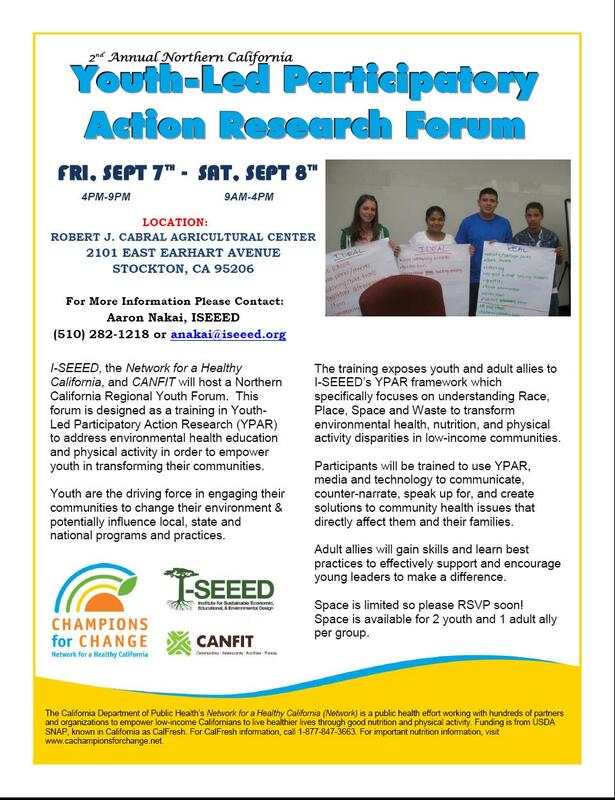 In collaboration with the Network for a Healthy California, the Institute for Sustainable Economic, Educational and Environmental Design (I-SEEED) and CANFIT, this Northern California Regional Y-PAR Forum was designed to share skills, technology strategies and frameworks that encourage youth to assess and transform their communities so that they can stay and thrive in them. The youth attending the forum will capture a glimpse of ISEEED’s model of understanding how Race, Space, Place and Waste affect their health and the health of their community. Also, by bringing together young folks across the region who are leading in youth-driven engagement, advocacy and environmental health transformation work, we hope to learn, share and build in a way that will elevate the youth’s role as regional and statewide leaders in community health. What are the Y-PAR Forum Goals & Objectives? 6.) Understand how technology, social media and digital tools can be utilized to develop effective ways to collect and analyze data, create and report solutions, and advocate for innovations that eradicate racial, socio-economic, and gender inequalities around environmental health, physical activity and wellness in neighborhoods, schools and communities. We’re excited for youth to share their knowledge, stories and expertise, and for everyone to learn from each other about the amazing things they are doing to transform their communities!